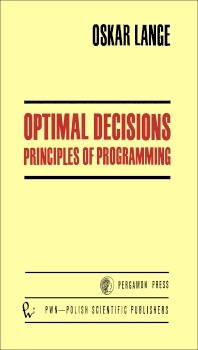 Optimal Decisions: Principles of Programming deals with all important problems related to programming. This book provides a general interpretation of the theory of programming based on the application of the Lagrange multipliers, followed by a presentation of the marginal and linear programming as special cases of this general theory. The praxeological interpretation of the method of Lagrange multipliers is also discussed. This text covers the Koopmans' model of transportation, geometric interpretation of the programming problem, and nature of activity analysis. The solution of the problem by marginal analysis, Hurwitz and the Bayes-Laplace principles, and planning of production under uncertainty are likewise deliberated. This publication is a good source for researchers and specialists intending to acquire knowledge of the principles of programming.